High Places, Ecstatic Sunshine, Cex, and Evangelista @ Market Hotel. Friday April 18th, 2008. I’m getting this up a little later than I had hoped…sorry about the delay. So this was my first experience at the Market Hotel, and I have to say that I was really impressed. I had heard stories about how it was way too smoky, and whatnot, but they put an end to smoking in the room where the bands play…and it was over all really enjoyable. The space really great, and plenty of room for everyone. We got to the show right around 10pm, and Evangelista (Carla Bozulich of the Geraldine Fibbers new band) started shortly after. So I picked the new album Hello, Voyager when it came out (klk had heard a track off of it on WNYU, and then TMT gave it a really killer review), and I really enjoy the album. 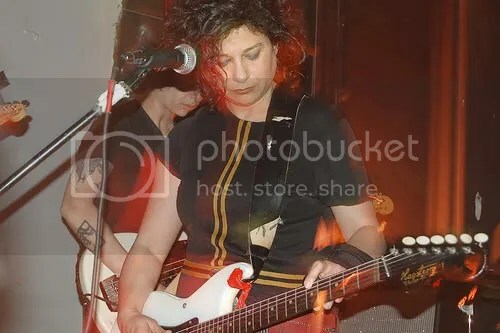 I wasn’t familiar with her earlier work, but later picked up the first record, which was released as Carla Bozulich’s Evangelista, which was also really good (I am still unfamiliar with Bozulich’s previous bands, but I am throughly enjoying Evangelista). Evangelista played as seven piece on Friday night. Their set started off noisy and atmospheric, with Bozulich on the floor. This part of the set was really cool, and I wish so many people hadn’t just talked through it…it was really distracting during something that could have been extremely beautiful. 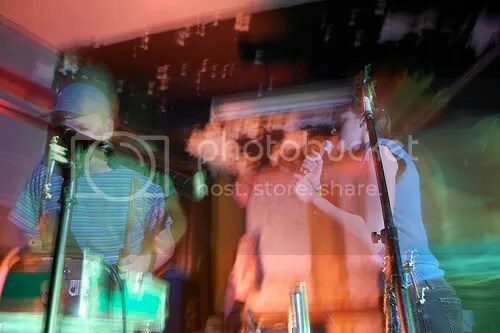 Bozulich emerged from her slumber on the floor and the band began to rock…it was no longer easy to ignore their presence. Bozulich is an intense figure, a bit belligerent, and really fun to watch. She storms through the crowd dancing, and singing and intimidating people. The band was a bit more of a rock band than I expected…but now thinking back on it I don’t know why I wasn’t expecting it…Evengelista pretty much sounded like they do on record, only bigger and more in your face…grungy and dark. It was kinda crazy that they were the opening act (they can easily headline a show). We were going to go see Evangelista again the next night as well at Cake Shop, but opted for Kids in The Hall in stead. 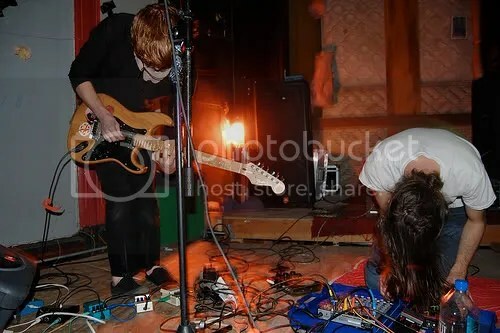 I’m glad I got to see them when they were in town, and I sure they were great at Cake Shop too. Cex played second. It was pretty much an electronic/DJish set. People were dancing. This was my second time seeing Cex play (he has sounded extremely different both times I have seen him…the first time it was a hip hop set). I know some people really dig him, but it’s just not my thing. Next was Ecstatic Sunshine. I was unfamiliar with them (except the bits and pieces I had heard on the internet), but I knew that they recently had a line up change (going from a four piece to a three piece). They play instrumental stonery psychedelic rock. So I know that string of adjectives can lump them in many categories, and I will try to elaborate. Live they were really loud and droney…very much a wall of sound…but on the recordings they appear to be much more intricate, atmospheric, and gentle. I enjoyed their set, but I wasn’t as fully immersed in the music as I would have liked to have been (next time I am going to try to be as close to the band as possible). Ecstatic Sunshine played a short set, but they were much harder than I was expecting from the recorded material I have heard (their record label even says that they are still a punk band at heart). I will definitely try to catch them the next time they come back to New York…I sense that there are even more interesting psychedelic things to come from these guys. High Places headlined the show, and by this point I was kinda drunk. This was my second time seeing the band, and I was still as excited as the first. Their set was very similar to the first time that I saw them…they only played two or three songs off of the emusic download, and rocked out quite a bit. I know that since I started writing here I have been pushing High Places, but their music is truly wonderful. Rob really goes crazy while on stage, and Mary’s voice is just beautiful. Although the crowd wasn’t moving that much we were all dancing, until there was an abrupt stop in the music…something fucked up with the sound system. Before the slight technical problem High Places songs were long and great for dancing (I had read that they were trying to make it so the songs didn’t stop as soon as people got into it, and it appears that they have been successful in this)…totally fun…but after the problem with the sound they only played two more songs, and they were both short….still really fun though. Despite the technical difficulties High Places were once again amazing, and so was the show over all. I’m really glad that I finally made it out to the Market Hotel (and hope to go back there again soon). Two comments on the venue…if coming from the L Train…make sure you know exactly where you are going (or be with someone who knows where they are going, not just says that they know where they are going)….and also the bathrooms at the Market Hotel are a bit rough (especially for girls)…they do not lock, and people can look over the door….it would be a great investment for them to install some simple latch locks on the doors (who knows maybe I will do it next time)…it would be a much better experience for everyone.